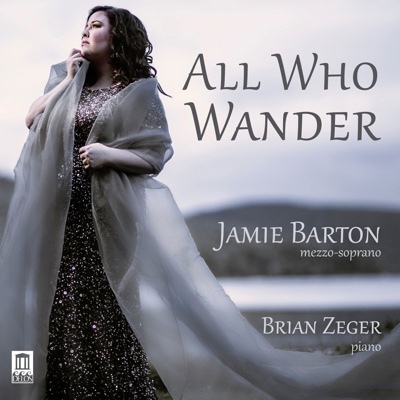 Jamie Barton has one of the great voices in the world today, sumptuous, flexible, and capable of light and shade, her sizeable mezzo pours forth seamlessly. Her tremendous operatic potential has already found a firm footing. She has sung Adalgisa and Giovanna, Fricka and Jezibaba—all to acclaim. In a recent Opera News feature, she said that Eboli and Azucena are on the way (though not Amneris) and that she feels entirely at home singing Wagner. To a fan of vocal music unfamiliar with Barton, all of the above would be enough to pique interest but there is more! Barton is equally formidable in the song repertoire, an interest reflected in her rare double win at the 2013 Cardiff Singer of the World competition, where she won both the opera and lieder prizes. She reminds one of a time when recitals were more popular with audiences and many opera stars spent equal time on the recital stage. In her debut solo album, All Who Wander, Barton surrounds Gustav Mahler’s staples of the song repertoire, Rückert Lieder, with the less familiar Gypsy Songs of Antonin Dvorák and select songs by Jean Sibelius. The most remarkable of the songs set to words of Friedrich Rückert is “Ich bin der Welt abhanden gekommen,” one of the great summits of German Lieder. In the accompanying booklet, Barton writes that this is the song with which she has lived the longest. This serene farewell to life is a mere 6-7 minutes long, but in the hands of great artists like Maureen Forrester or Jessye Norman, it achieves the effect of seemingly stopping time. Barton shows herself worthy of that notable company, fully capturing the song’s essential repose. Barton finds a splendid partner in pianist Brian Zeger who conspires with her to create an exquisite atmosphere for the monumental song. His playing enriches every selection in this album. His years of experience working with singers show in his naturally supportive and responsive collaboration. His pianism has clarity and warmth, delicacy and power. He phrases with flexibility without losing the shape of a melody. He highlights individual voices but always keeps the big picture in mind. Zeger arguably does his best work in the Dvorák selections, capturing the playful buoyancy of the gypsy songs, leading Barton as well as supporting her. Zeger and Barton open with the Rückert Lieder and a delicate “Ich atmet’ einen lien Duft” which sets a reflective tone for the album. Possibly my favourite selection is the second track, “Liebst du um Schönheit” which Barton delivers with an outpouring of warmth that moves me every time I listen to it. “Matronly” is usually not flatteringly used to describe singers, however, in this song and many others, the word can be applied only glowingly to describe the tender embrace of Barton’s vocal art. Her rich voice and heartfelt delivery coax and comfort the listener. “Um Mitternacht” allows her to exploit her pungent lower register while conquering the song’s finale with breadth of tone. As the track demonstrates, Barton’s voice at full cry is thrilling to behold but the majesty of her instrument never overwhelms the songs. Her ability to lighten her tone, especially in the tricky upper middle voice, notably allows her to sing with expressive freedom. She rounds out the Mahler selections with three songs from his Lieder und Gesänge aus der Jugendzeit. “Ich ging mit lust” comes too quickly after “Ich bin der Welt abhanden gekommen” with inadequate pause given between tracks, but the song continues the still mood which Barton delivers with poise. After an urgent “Errinerung” which is mined for all its dramatic potential, she tosses off “Scheiden und Meiden” with lusty delight. The rustic nature of the song transitions nicely into Dvorak’s folk-tinged Gypsy Songs. The most famous of these songs is the fourth selection, the beloved “Songs my mother taught me” (with apologies to the Czech-literate, I use the songs’ English titles), which Barton sings with affecting melancholy. But rest of the songs deserve to be better known. I love the playful bite of the second song, “Ring out, my triangle”, the introspection of the third, “All about the woods are still”, and the abandon of the invitation to “Come and join the dance” in the fifth. In each selection, she displays sincere musicality, with detailed phrasing devoid of affectation. Though Sibelius’s shimmering writing for the piano frequently evokes icy Nordic landscapes, the vocal writing is anything but cool. The vocal lines in these songs are the most operatic of the whole album and find Barton offering her most consistently full-voiced singing. The selections, chosen from various sets, are remarkable for their large-scaled mood achieved in relatively short length (all but one are under three minutes in duration). “The girl returned from meeting her lover” has a surprisingly opulent setting but is also emotionally urgent. “Kiss’s hope” and “The March snow” bring introspection before “Was it a dream?” carries the album to a close with valedictory sweep. Barton brings an intimate grandeur to the Sibelius songs, satisfyingly filling out the large vocals while retaining an immediacy in her delivery. Though her voice and musicality would be enough to declare this album a thorough success, Barton’s attention to the text must not go unmentioned. Her German is very good and although I cannot speak to the quality of her Czech or Swedish, I can say that she is diligent with her enunciation. All Who Wander is everything a song recital should be. Delivering both familiar and unfamiliar fare in beguiling interpretations, Barton and Zeger take the listener into the world of each song with deft musicality and emotional sincerity.